‘The dog ate my wheelchair’ is a unique video installation exploring the experiences of disabled people throughout the region. Working with Disability North and an established artist, the project will bring together disabled people from rural and urban areas. We will meet to discuss innovations that support (or hinder) everyday lives, dream up ideas which could improve our lives, and generally swap stories about what it is like to be a disabled person living in the North. If you are interested in being part of this once in a lifetime opportunity which will raise the profile of disability issues in a major national event, then please sign up. 11am-1pm Saturday 21st April 2018. Refreshments will be provided and reasonable travel expensed reimbursed. Spaces are limited. For more information or to sign up, contact Disability North’s Chief Executive Officer, Victoria Armstrong at victoriaarmstrong@disabilitynorth.org.uk or 0191 2840480. 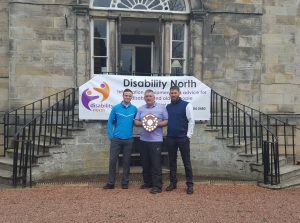 Disability North Golf Day 2018 – Still Time To Book!